Annette Stipp is the next witness on the stand. She is the wife of Dr. Johan Stipp. She is an Occupational Therapist. On the night of February 13, 2013, she was at home with her husband, three kids and domestic worker. They went to bed around 10-10:30pm. That night she was slightly flu-ish so was awakened by coughing. She was contemplating whether or not to get up for some water. She looked over at the clock radio and it said 3:02am. Typically that clock is about 3-4 minutes fast. She decided she would get up for a drink and just as she was about to sit up, she heard what sounded like 3 gunshots. She asked her husband if he had heard that and he said yes. She asked him what it was and he said gunshots. She sat up on the edge of the bed and could see the lights on at the two houses that are in view from her bedroom window. This is her view from her side of the bed – she is closest to the small balcony window which is seen here. Her husband jumped out of bed to go to the balcony. While his wife was expressing to him that maybe he shouldn’t go out there, they heard the screams of a female. The whole sequence happened very rapidly. Shots, then immediate screams. They both went out on the small balcony to see where the screams were coming from but they couldn’t tell. They could only see the two houses with their lights on. They then moved to the larger balcony, as there is a better view from there. The large balcony has a white circle around it. The small balcony is the one that is just above the garage. The screaming continued for several minutes, it was constant. She described them as the terrified screams of a woman. Mrs. Stipp then stated at one point, it sounded as if the screaming was coming closer. She said to her husband “is there somebody coming down the street screaming?” But they didn’t see anybody. They were out on the balcony for several minutes trying to figure out what was going on and where it was coming from. Dr. Stipp stated “well there was a man moving in the house on the left hand side.” She said to her husband “it sounds to me like there’s a family murder.” He then said he was going over there to help because there could be children involved. Dr. Stipp went back inside. He walked in and dialed 10111 and could not get through. Mrs. Stipp then decided that she should go inside and help to make calls since her husband was trying to get dressed and call at the same time. As she turned to go inside, she again looked at the clock radio and it said 3:17am (again, typically runs 3-4 minutes fast). At that moment, she then heard 3 more shots. Her husband then yelled at her to get away from the windows. They quickly obtained another security number and called it. A very short period after that, security arrived at their house. Mrs. Stipp then moved over to the small balcony (which overlooks the driveway) and told them that theirs was not the house that the sounds were coming from. She told them the sounds were coming from the house with the lights on, on the left side. They must please phone police since they were unable to get through and there were already 6 shots fired. That’s when security left and headed to Oscar’s house. The screaming they had heard earlier continued all the way up thru the very last shot. She testified that they also heard a man screaming. She stated to her husband “there is also now a man screaming.” She could not hear what he was screaming, she could not make out words, but it was a definite male voice. After the second set of shots, it just became quiet. She heard no more screaming, neither male nor female. Nel asks her if she also saw the man walking in the house, just as her husband did, but she did not. She is aware that in her statement she originally said she did but after really thinking about it, she did not, so she had them change it. Mrs. Stipp also stated the house that they saw to the right of Oscar’s from their bedroom balcony had all of their lights on in the top story of the home. The house on the left (Oscar’s) has two sets of windows (one is the toilet room window and the other is the larger bathroom window) and one of the windows was open. Here is an aerial view of Oscar’s bathroom windows. The toilet room window is on the left (the smaller one). The bathroom window is on the right. The white circle indicates the portion of the window that was open. According to Mrs. Stipp, the light remained on the entire time. On February 21st of this year, she and her husband woke up during the night from what sounded like people arguing. She asked her husband if he heard it and he said yes. She then said “there’s no way we are getting up this time, we’re staying where we are, they must sort it out.” Her dog started barking loudly then so they just closed their balcony doors and went back to bed. The next morning their neighbors came over to see if they could hear the commotion the previous night and they said they could but they chose to ignore it. The neighbors then said that there were people in their garden on the grass. They pretty much realized at that time the sounds were likely sound testing being done in relation to the trial. And then again, on March 17, just last week, they were awoken again in the middle of the night to screaming. They could tell it was a man who was screaming at a higher pitch and then again at a lower pitch. Mrs. Stipp was completely annoyed because it was again 3:30am in the morning. She said to her husband that she’s sure it’s sound testing again, so she went out on the balcony and saw 2 males standing in their garden. She made some comment to them and then went back in to the house. These screams that she heard were nothing like the screams she heard on the morning of February 14, 2013. During the original incident it was continuous screaming and it was absolutely female. This was not. 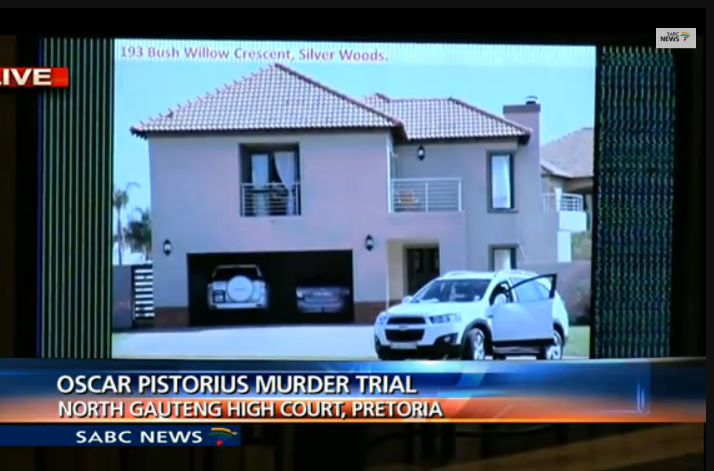 She states she does not know Mr. Pistorius, nor did she know that he lived in that home on the night of the shooting. When they first moved in to the estate, the estate agent had told them that Mr. Pistorius lived there but she wasn’t sure exactly which house. The house that the agent pointed out to them turned out to be a different house. 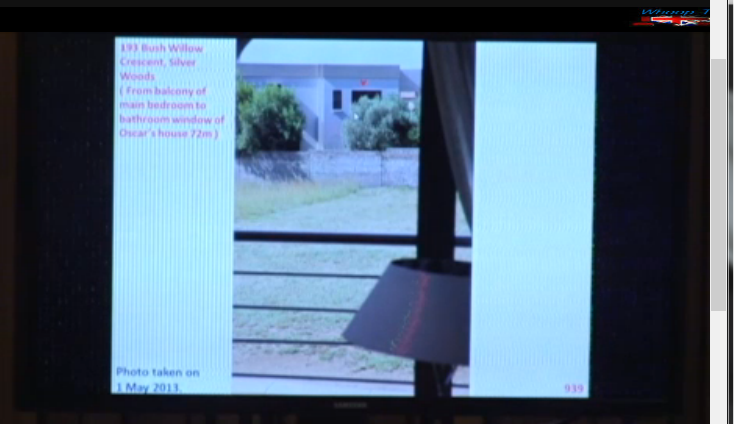 Dr. Stipp went to the Pistorius house that night and came back home around 4:20am. Mrs. Stipp asked him what had happened. He wasn’t very talkative and looked upset. He said it was a man that had killed his girlfriend. She asked him what he looked like and he said he was very muscular and had tattoos on his back. But he didn’t pay as much attention to the male as his main concern was the female. They were not able to sleep at all that night. Then at about 4:40am, they received a call from Mr. Stander to make sure he had the right telephone number and to let Dr. Stipp know that he would be contacted by Oscar’s lawyer. At this time, they still had not put two and two together. They did not know it was Oscar Pistorius. The next morning, Mrs. Stipp was chatting online on her WhatsApp chat group, discussing what their husbands or boyfriends had done for them for Valentine’s Day. Her response to the group was that they had a very crappy start to their day because their neighbor had killed his girlfriend. Everybody responded saying that’s terrible. She wrote to them that the thing she’ll never forget was the terrible screaming. They then got the children ready for school, her husband left for work and she opened the back door for her domestic worker at around 7:45am. The domestic worker asked Mrs. Stipp what happened the previous night. She had heard the noises. She is usually awake at around 3am and was talking to her husband when they heard a female start screaming. She at first thought it was a baby but then went outside and realized it was a woman. Mrs. Stipp relayed to her that there had been an incident across the road. At around 8:15am, Mrs. Stipp received a call from her friend. The friend asked her if she had seen the news that morning and she replied no, she hadn’t. Her friend told her she was sure that the neighbor she was talking about was Oscar Pistorius. This is when she found out for the first time who lived in that house. 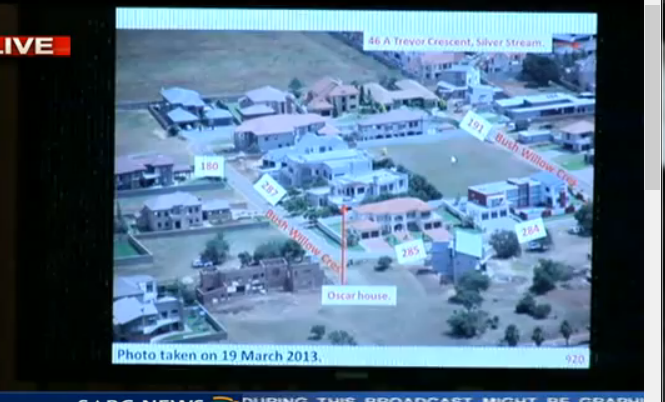 Since the time of the incident, two houses have been built on the lot in between Oscar’s house and theirs. This is important because any sound or sight testing that they are doing now would not match the conditions of the area on February 14, 2013. You can see the lot as it was in February 2013, wide open. Nel concludes verifying that Mrs. Stipp did not know the van der Mewres, Michelle Burger or Charl Johnson before this incident. Oldwage (not Roux) gets up to cross examine. This guy makes Roux look like a teddy bear! He wants to know how closely she has followed the coverage of this case in the media and if she has discussed it with her husband. She states that yes she has discussed it with her husband, naturally, and she said it’s impossible not to see it in the media because of the amount of coverage. But she has not sat down and watched it. Oldwage is proposing that her memory is somehow damaged by what she has heard by others. Clearly she must have been influenced. The defense uses this tactic on every single witness. He then goes through her exact movements that morning. He also tries to evaluate her level of alertness from 3:02 to 3:17. She states it was the same throughout. He pesters her around and around what she and her husband discussed about this event, insinuating that they have colluded on their statements. She gave no indication that was the case. He actually went so far as to ask her exactly how she was lying on the bed, if her feet were touching the ground when she sat up, etc. He’s just trying to trip her up on any detail to try to prove that she didn’t hear or see what she thought she did. She stands firm. He then asks her if she heard muffled screaming when it first began and she said no, it was loud and clear screaming. I get where he is going with this. Reeva, presumably is in the toilet room at this time because the Defense maintains that the first round of shots heard are the shots that killed Reeva (right around 3am) and that she never screamed. The only person who screamed that night was Oscar. If it’s muffled screaming then maybe that would leave open the possibility that it’s Reeva screaming in the closed toilet room. But if it’s loud and clear screaming, then they propose it is Oscar who is in the main portion of the bathroom near the open window. She sleeps on the side that is closest to the small balcony over the garage and when sitting down (not standing up as this photographer is), she has a clear view of the homes across the open lot. Oldwage has an issue with the fact that the curtain is being held open by a hand. He states that it is to give a better view of the homes, which it is, but putting in to question whether or not she can actually see out this window which is a fair question. But she points out that when that curtain is tied normally by a decorative rope and she is laying or sitting in bed on her side, she does have a direct view of the homes. The argument went on for a while about the positioning of this curtain but whenever the Defense is this desperate to argue every minute detail, it tells me that they need this witness’s testimony to go away. It’s obviously very damning and the fact that she saw a light on at the same time that the female was screaming for almost 15 minutes, prior to the last round of shots, is obviously a huge problem for Oscar. Oldwage made 2 or 3 different arguments during his cross examination with Mrs. Stipp that were stopped by the Judge. The Judge was seemingly very aggravated with him. At times he was badgering the witness and asking questions that were not appropriate for this portion of testimony. So she reprimanded him a few times. He definitely does not have the same finesse as Roux. Nel wraps it up by showing this picture to Mrs. Stipp. From this picture, you can see the lamp and the edge of the bed in the window. That is where her head would be. When the curtain is normally tied back with the decorative rope, which it was on the night in question, you can tell that she has clear sight out of that window. Next witness up is Francois Moller. He is a Captain in the South African police service, stationed at the technology investigation support center for detective services. Colonel Michael Sales, who testified last week about the iPads, is his commanding officer. 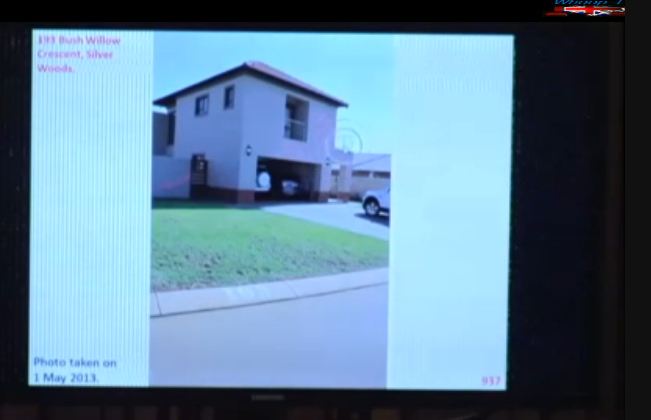 He received 4 cell phones (2 iPhones, 2 Blackberries), 2 iPads and a MacBook computer from Hilton Botha (the original investigator) on February 15, 2013, all seized at the scene. He removed the sim cards from the smart phone (iPhone) devices to ensure that there was no tampering or communication with any devices from the time he started his investigation to the time he finished. With the sim cards out, there is no exact way to determine the phone numbers for the devices. So he started with the device that was marked as Oscar’s device, went in to his last contacts on the phone, and established the number for Reeva. 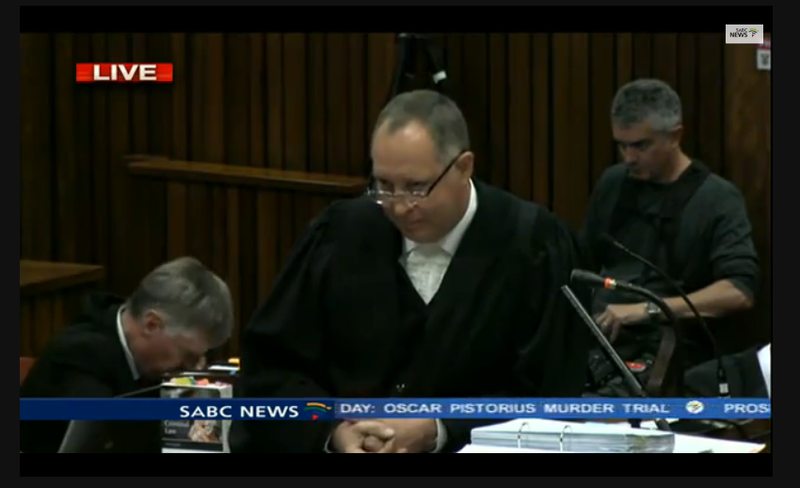 He then did the same to establish Oscar’s number, by looking at Reeva’s phone. He was under the impression that Oscar had only one phone. He then applied for data records from the network service providers based on the phone numbers that had been allocated for each phone, per above. From this, he was able to establish that the number he believed was for Oscar’s device was in fact not the right number. This device that was seized at the scene and marked as Oscar’s actually had a different phone number. Meaning… there was another phone out there that Oscar was using (that Reeva had recently called) that had not been seized at the scene. That phone was later turned in to the police by the Defense on February 26, 2013, after Oscar’s bail hearing. It was established that the two Blackberries found on the scene were last used in late 2012, two to three months prior to the date of the incident. Oscar had done a sim swap with the Blackberry service provider to get sim cards that would fit in to his new iPhones. He turned in the old larger sims from the Blackberries, got new smaller sims that would fit in the iPhones and was able to keep his same phone number and data. The new sim cards in the iPhones would have different serial numbers than the ones he originally had in his Blackberries. Therefore, when Moller turned all of this information in to get reports, he received data records back for only 3 phone numbers. Those phone numbers were for Reeva’s one iPhone and Oscar’s two iPhones. In addition to obtaining data records, he also did downloads/extractions of the devices via linking the devices with a computer, utilizing forensic software. There are two types of data extractions. The first is “logical” extraction which is all of the data that the user can see on their device. 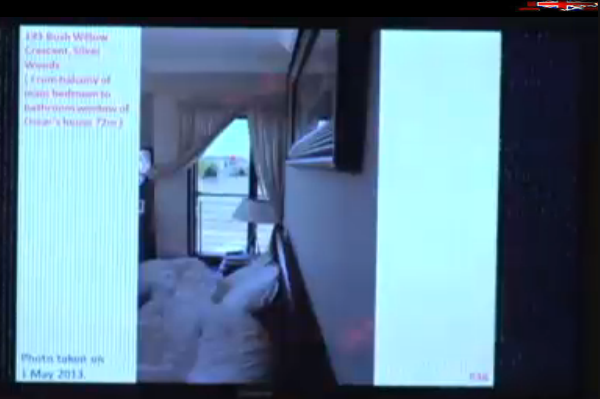 For Reeva’s device, the logical extraction report was 2,600 pages. The other type is called a “jail break”. With jail breaking you can install any 3rd party applications to the device, which they did, and receive even more data including deleted data. The print out from this extraction was over 35,000 pages. The investigators then read through all of the chat messages on the phone, including text messages and messages from the WhatsApp app, which totaled 2,731 messages. They did find messages that they felt were applicable to this case and they printed extractions from that to bring to court. They were also able to pull off two email addresses for Reeva from her phone, one was a webmail account and the other was a gmail account. Moller then proceeded to read through only the relevant messages, at Nel’s prompting, that gave a glimpse in to some potential relationship problems that Oscar and Reeva were having. Moller did make note that 90% of the communication between Oscar and Reeva was normal and loving. And the rest of it showed some potential issues. Court adjourned for the day. Moller will be back on the stand tomorrow. So the Stipps heard 3 bangs, a woman screaming, 3 (or 4?) more bangs then silence, suggesting the strikes with the cricket bat to the door came before the shooting? It sounds as if he may have shot her through the already damaged toilet door …. Yes, their evidence is enormously important and I agree that they heard all of the “culmination” of the event. 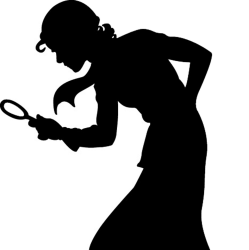 Nel did not clearly establish whose phone found at the crime scene under the towel on the bathroom floor belonged to ? can you clearify that and from which evidence? was the black (cover broken) phone Reeva’s and the white phone was Oscars? These are the 2 i phones retrieved on Feb 15? Read both Day 14 & 15 evidence from Moller. It was established that the white iPhone under the towels was Oscar’s with the phone number ending in 4949. 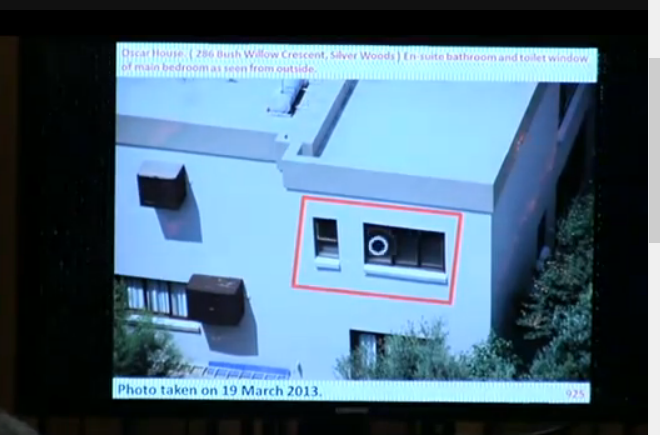 The black iPhone near the gun was Reeva’s, also established. Very good, solid testimony from mrs stipp. Oscar hasnt been able to counter this. The bathroom light being on and the IMMEDIATE female screams after the first bangs lasting several minutes thru the last bangs (then silence) are an enormous problem for Oscar’s story. i think mrs stipps testimony is extremely important. why was the possibility of the cricket bat hitting the door first not considered by mr. nel…this seems highly likely. i hope this can still be condsidered by the judge and assessors. Did they find all the pellets from the air gun or were they missing? There were no pellets found. I believe the State likely did not address the hole in the bedroom door because they didn’t have any evidence to prove that the damage occurred that night… Other than the photos from which the judge could make an inference… Which of course, she did not.